Ornstein is believed to be the captain of the Four Knights of Gwyn. He stands guard in the Anor Londo cathedral, alongside Executioner Smough, protecting the princess Gwynevere. Lord Gwyn split some of his Lord Soul and gave it to his four most trusted knights, including Ornstein's Soul. Gwyn also gave them special rings; Ornstein receiving the Leo Ring. His golden armor was made to resemble a lion and was imbued with the power of lightning. It is said that his lugged spear could slice a boulder in two. After the gods fled Anor Londo, Ornstein guarded its cathedral alongside Executioner Smough. At some point, Ornstein left the cathedral in search of the Nameless King. It is unclear how Ornstein survived the battle against the Chosen Undead, but it appears he eventually found his way to Archdragon Peak. However, the results of his search, as well as Ornstein's own fate, remains unknown. Waragai: I really like Ornstein and Smough. Miyazaki: Those were both Mr. Nakamura's designs. I personally really like Smough's armour. Nakamura: He was the first thing I designed. Miyazaki: Smough came form the initial concept stages, while Ornstein was introduced much later. I remember the Channeller's design was put forward around the same time as Smough's and we all took to referring to them as the four knights; Knights C and D, if I remember correctly. I hoped that by doing this, it would ensure that Knights A and B were implemented. 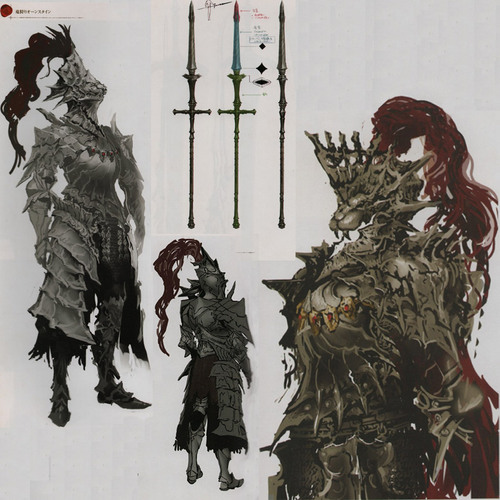 In the end they never were, the four knights disappeared and the design work for knights A and B was transferred to other characters like Ornstein and Artorias. The Channeller was given a different role, so that left Smough. I'm extremely fond of the design so I wanted to do something special, turn him from one of four knights into something almost… heretical. I'm sure made the designers and programmers really angry because I forced them to make his armour equippable. Otsuka: You really were fond of him, weren't you? Miyazaki: He offers a substantial challenge for the player, too, doesn't he? Otsuka: I thought the strongest boss in the game was probably the Capra Demon. Waragai: For me it's undoubtedly the fight with Ornstein. Miyazaki: There's something unnatural about Smough's armour, it doesn't look like something that would have been created by a normal, sane person, I think that's what I like about it. There was a rumour that we were hunting players who bought the game early. I wasn't us, but whoever it was, they were wearing Smough's armour and I remember thinking how fitting it was. Nakamura: We talked at length about [Ornstein's Spear], and about how you could pierce through the tough dragon scales. Miyazaki: There's only so much you can do with a spear, so it can be difficult to design, but once we hit upon the idea of using your body weight, the design emerged pretty quickly. Nakamura: Yes, the shape of the weapon was based entirely around the idea of stabbing the dragon, and then using all your body's weight to force the spear deeper. Miyazaki: I like the dragon weapons, especially the Drake Sword and the Moonlight Greatsword, I'm really happy with the way they turned out. Miyazaki: Ah yes, one of the early designs. I thought the Dragonslayer Greatbow looked great and once we added the animation it really came together. The Leo Ring belonged toOrnstein the Dragonslayer. This ring strengthens counters with pierce weapons. His lugged spear is said to have sliced a boulder in two.